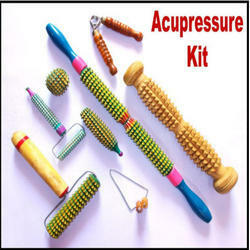 Wooden Acupressure Tools used to relax pain and used by physiothrapist. Made by shisham wood and available in various design & Sizes. acupressure jimmy for putting pressure on specific points anywhere on the body. ACS Acupressure Spine Roller Massager-Super is based on acupressure and magnetic therapy. It consists of magnetic wheels. It is useful for backache and spine trouble. It Tone up of spinal nerves and revitalizes total body, removes stiffness. For better result use with gentle up and down pressure on both side of spinal column from neck to hip and the stroke can be extended up to leg. we offer Magnetic Body Twisters and Acupressure Twister in a single body twister. Acupressure :- A common modality, is an ancient art of healing therapy that uses the fingers to press key points on the surface of the skin and thus stimulate the body's system to self heal. With acupressure, the person may remain fully clothed and suffer no side effects from drugs, while experiencing a safe treatment.